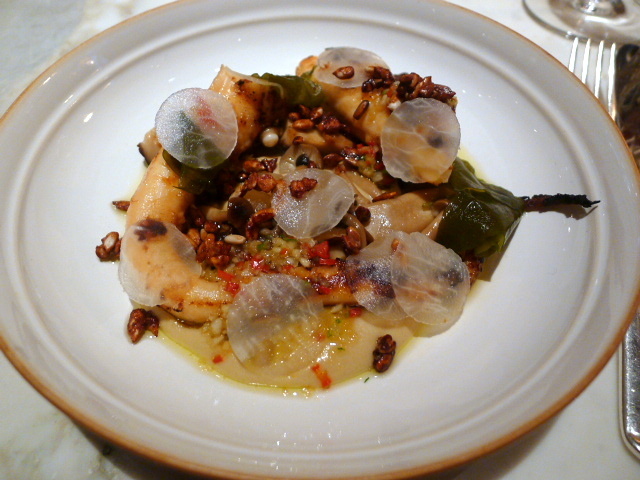 Chiltern Firehouse is THE hottest restaurant in London at the moment. It’s so much of a sensation that it has become a regular on the celebrity circuit. Barely a day goes by where there isn’t a press mention of an A-lister passing through its doors. Chiltern Firehouse is owned by property magnate André Balazs who is known for his luxury hotel portfolio which includes Chateau Marmont in LA and The Mercer in New York. Balazs has similarly converted the Chiltern Firehouse property, a Grade II-listed building that was once home to the Chiltern Street fire station, into a luxury hotel. 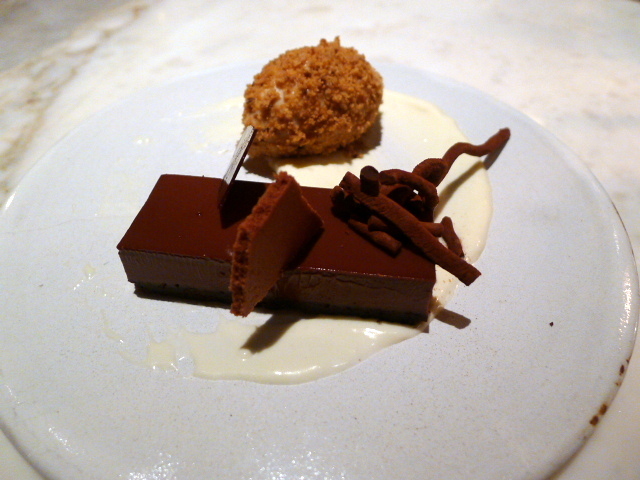 The restaurant is run by Chef Nuno Mendes who needs no introduction to those who know the London dining scene well. He trained at El Bulli and his last residence at Restaurant Viajante went on to receive great critical acclaim as well as a Michelin star. Working along side Mendes is Dale Osborne who previously cooked at Dinner by Heston Blumenthal. The entrance to the Chiltern Firehouse is closely guarded with admission being impossible without a reservation. Once past the security, there is a lovely courtyard seating area with a fireplace where you may sip an aperitif before dinner. Inside, the restaurant is a statement in understated luxury and comfort. The bar area is tiny however, and the tables are tightly packed together. There is an elevated open kitchen where one may watch the chefs at work. The food deviates from that previously found at Viajante where innovation and originality was the key. Instead, the food at Chiltern Firehouse is more modern American, drawing on the time Mendes spent with Jean-Georges Vongerichten and Wolfgang Puck in the US with items such as fried chicken and cornbread fingers to be found. The chicken and the cornbread are listed on the small-bites section of the menu. 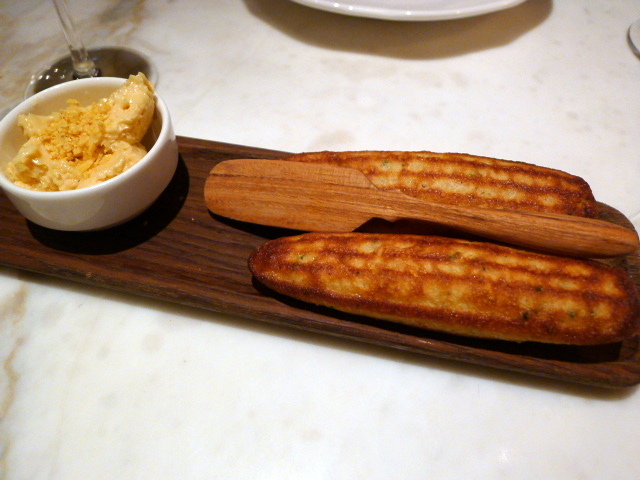 We loved the cornbread fingers as its texture was excellent and surprisingly light with a chipotle-maple butter to use as a spread. The butter was divine with its gentle hint of sweetness and went wonderfully with the bread. 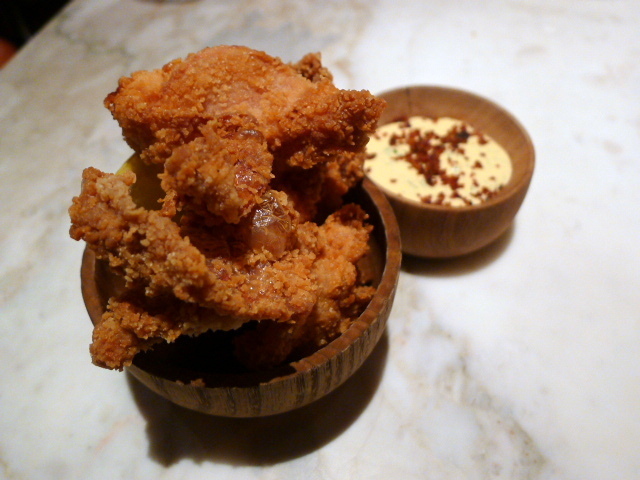 Fried chicken (£6) was fabulously crunchy and the accompanying smoky-bacon ranch dipping sauce made a good match for the chicken. 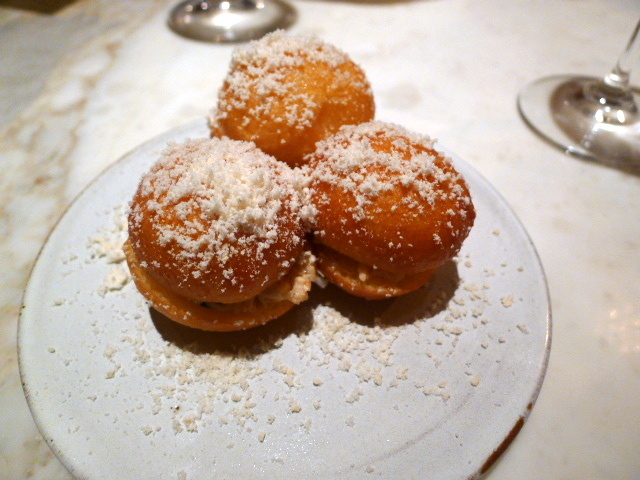 But the small-bites that everyone talks about are the crab-stuffed donuts with coral dusting (£6) which were delicious. The crab was lovely and sweet, and there was something supremely heavenly about the donuts with their light and fluffy texture. The combination of the crab and donuts worked a moreish treat and the coral dust was a masterstroke. Grilled octopus (£16) was wonderfully tender, having first been gently braised with onions and white wine before grilling for a charcoal effect. There was a hint of an Asian twist to the dish with the use of daikon, wakame and mushrooms marinated in mirin and soya sauce. An aubergine puree served as the base of the dish and was smooth, creamy and deliciously earthy. A second starter of green and white asparagus (£12) had been nicely cooked with the asparagus holding on their bite. 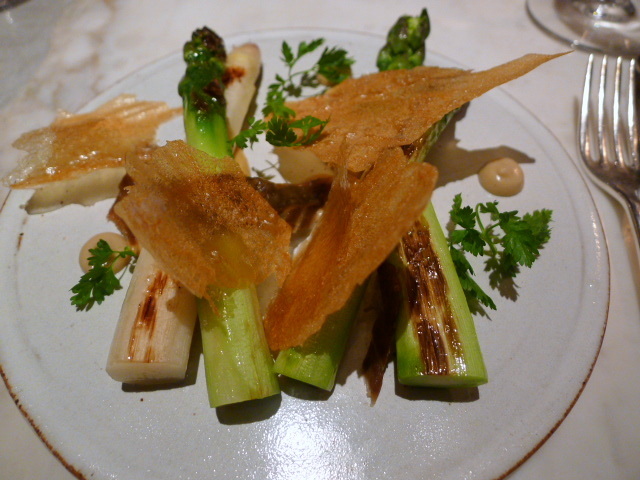 To dress the asparagus was some chervil, a creamy brown butter sauce and some yeast crisps. All the individual elements of the dish were nicely done, but our lasting impression of the plate was that it was all rather dull. 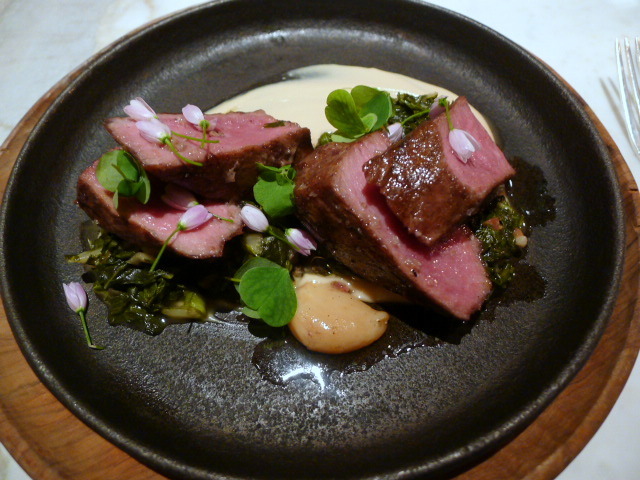 Chargrilled Iberico pork with roasted garlic and collard greens (£29) came highly recommended by our waiter. The pork was gorgeous and pink and impressively tender, and the roasted garlic was sublime, making for an explosive taste sensation on the palate. However, we found the base of collard greens slightly wet and a touch salty. 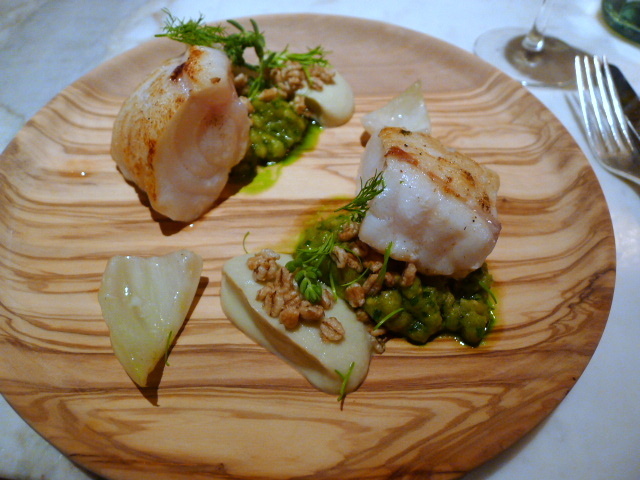 Monkfish cooked over pine (£28) was meaty and moist and was interesting for its delicate hint of pine flavour. It came with puffed barley made with miso and lemon juice that gave a touch of acidity to the dish. Slices of fennel were beautifully tasty and the fennel puree was wonderful. I liked this dish, but probably more for its concept then for the final result itself. It was technically excellent but it didn’t overwhelm me with waves of punchy flavours and it left me wanting for a sauce. Desserts were beautifully presented but miserly in size. A citrus tart (£9) came on a luxurious almond sponge and although tasty, was lacking in punchy citrus overtones. 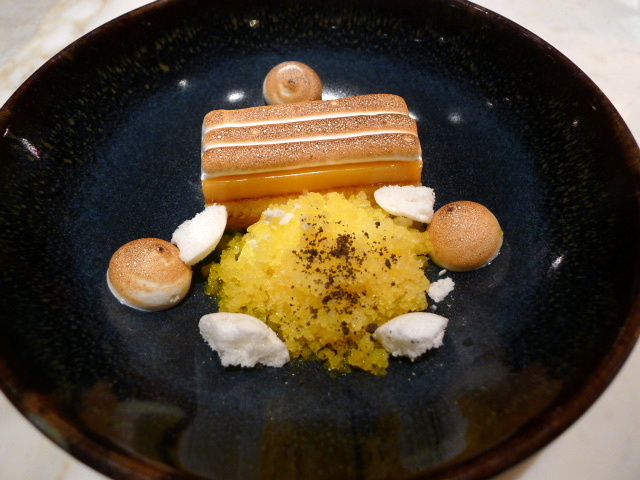 Accompaniments included vanilla shortbread, a sea buckthorn curd, mandarin granite and some fabulously airy meringue. A chocolate tart (£9) on a chocolate sponge with chocolate custard, cocoa tuile, dried chocolate mousse and hazelnut ice cream was technically excellent with the chocolate custard being the height of smoothness. But it was again tiny in size and ungenerous from this perspective. The food on the whole was technically excellent and still hints at the Mendes of old. The small-bites were decidedly American, but as we moved towards the starters and the mains, there was more of a sprinkling of an Asian twist that showed off attempts at eclecticism. But all said and done, we warmed to certain dishes more than others as we found one or two items to be a tad dull. The service was flawless with the waiting staff having come from other high-end establishments in London such as the Ritz. Prices were a little high with mains hovering at the £30 a plate mark. The service charge was also a cheeky 15%, but then again money is usually no object for celebrities. On that note, our biggest disappointment of the evening was that we didn’t manage to spot any A-list celebs. Where were they? Prices: £45 to £61 for a small-bite, starter, main and a dessert. Excludes drinks and service.